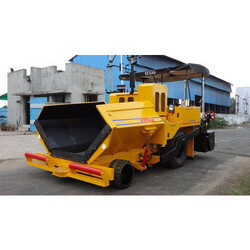 We are offering wide range of Mechanical Asphalt Paver Finisher. Air Brake for effective braking. Special Design of chasis for more strength & stability. All operational controls are provided at one dashboard. Autoparts of TATA / LEYLAND vehicles for easily availability of spares. 'KESAR' Pavers is based in Preston where we have our production factory, service department and stores department. We have continuously manufactured in our Factory at Gozaria, Dist: Mehsana, Gujarat, India Since2005.Our range of rubber tyred Paver Finishers provide paving widths from 2.5 meter to 4.5 meters and on customer requirements up to 5 meters with depths from 10 - 200mm. Paving Width 2.5 mtr to 4.5 mtr . 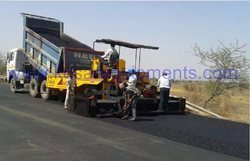 Kesar Asphalt Paver Finisher is Sutable to finish the Asphalt & Wet mix - Dry Concrete Road very fast to meet todays requirement to avoid trafic problems as per MORTH Specification. The Screed Extension is done hydraulically with a basic Screed of 2.5 Meters which can be extended upto 4.5 Meters. The Paver Finisher not only does Asphalt Paving but also Wet Mix Paving. We are the leading supplier of Wet Mix Macadam Paver Finishermade available to our clients at competitive prices. Mechanical Asphalt Paver Finisher offeredcome with water cooled option as well as meet demands of strong and reliable working support. Also finding suitability for use in low temperature environment, these paver finishers come with independent scraper and auger support and allows for easy operation support. 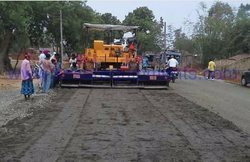 Some of its features include driver with wide eyeshot that allows smooth movement of control panel to L/R; allows for efficient and improved paving experience; provide support as automatic leveling device for smooth road laying; automatic leveling device; advanced electric system that allows easy functioning support.